Let us help to tell your love story in flowers. Tori and Robbie's wedding was one for the books! 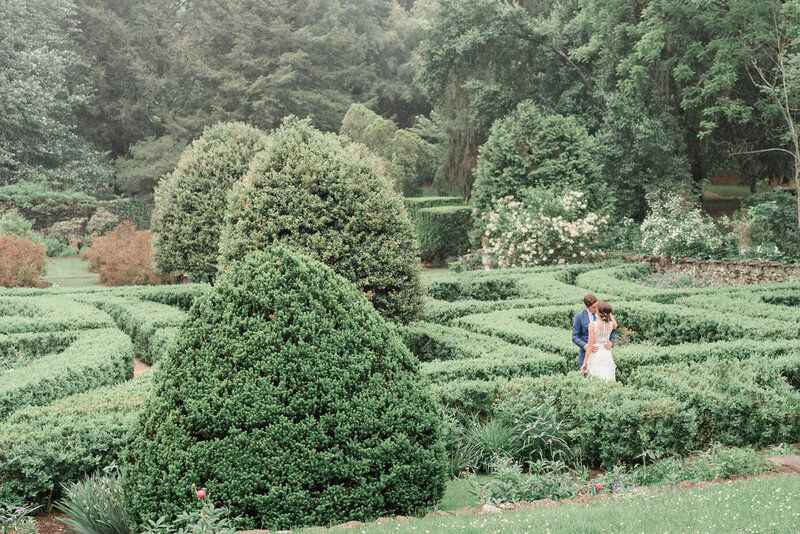 I've designed many outdoor wedding ceremonies but nothing quite like their wedding at Airlie. Tori found me thanks to her loving the aesthetic of my website, and we immediately hit it off at her consultation. During the months leading up to the wedding, we exchanged plenty of ideas, and even though Tori knew what she wanted, she was very open to design ideas (dream client! ), so we got along wonderfully. She wanted a classic, romantic, and timeless design for her wedding day, and I suggested that to do something special for her ceremony, we should try a circle of love arch in the garden filled with greenery and white blooms. Tori was ecstatic about the idea, and we began our planning. Wedding day came and so did the floods of rain. It had rained all week and was supposed to continue with a light shower right around the time of the ceremony. 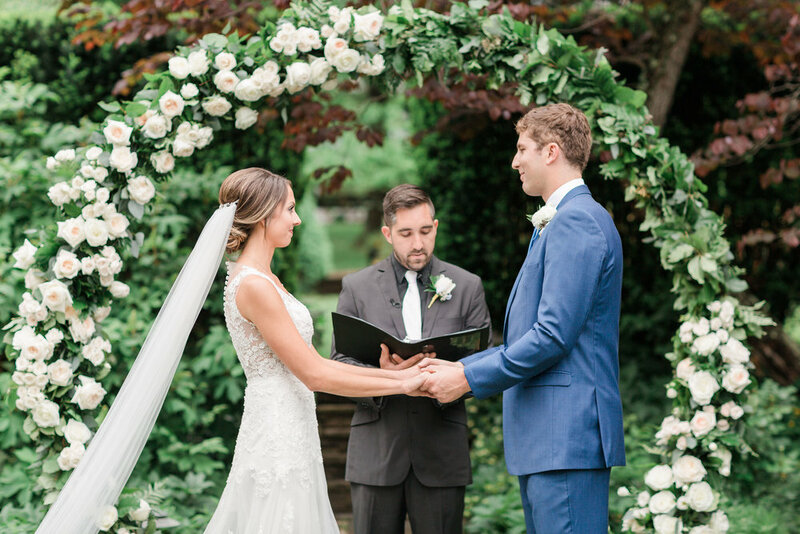 We made a plan B for moving everything inside, but when it was time for a decision to be made, Tori had her heart set on the outdoor ceremony she had envisioned. So, her incredible vendor team stepped right into action to make that happen. We got to use a variety of flowers for their arrangements, including garden roses, peonies, spray roses, stock, and an abundance of greenery to create an effortless, classic, and organic feel to go with the garden theme. By the time the ceremony rolled around, you wouldn't have known they'd been calling for rain. 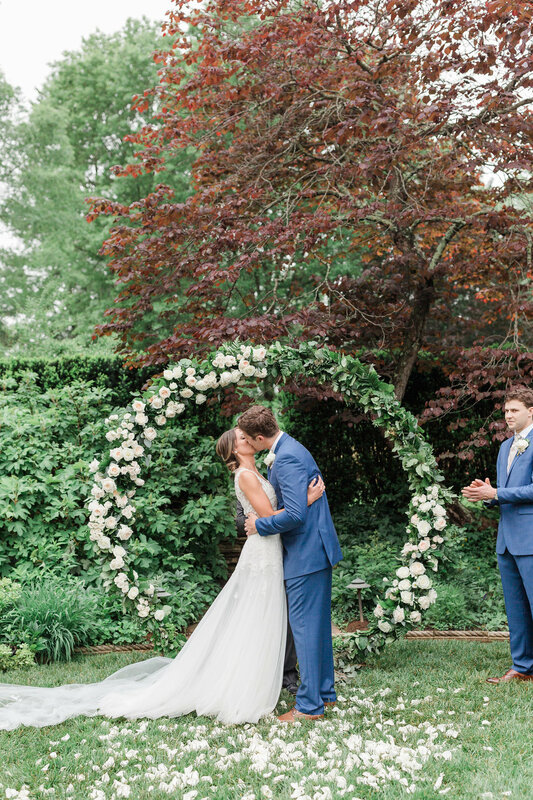 Tori got her clear, blue sky, and she got to marry Robbie in the most romantic garden ceremony you've ever seen, with love and fresh flowers surrounding them everywhere. The reception featured garlands with pastel-colored flowers interlaced into the greenery draping each table, and rose gold arrangements were filled with abundance of spring flowers, like ranunculus and peonies. We know that Tori and Robbie are going to have an abundance of bliss (much like their abundance of flowers) in their new marriage. We are so happy for them and we wish them many years of love and happiness to come! © Chic Girl Flowers. All Rights Reserved.